The Miami Herald reports that a Tampa Bay mother of four spent five months in jail after a drug field test erroneously tested positive for oxycodone. It took that long for her husband to accumulate the money to post bail. It then took another seven months before the state crime lab showed the field test to be in error. We’ve been keeping a running list of the items that have resulted in false positives on these field tests. That list includes sage, chocolate chip cookies, motor oil, spearmint, Dr. Bronner’s Magic Soap, tortilla dough, deodorant, billiards chalk, patchouli, flour, eucalyptus, breath mints, Jolly Ranchers, Krispy Kreme donut glaze, exposure to air and loose-leaf tea. The latter item triggered a SWAT raid on an innocent couple and their two children. In 2016, a report by Pro Publica and the New York Times found widespread false positives and user errors by cops when administering the most popular tests. Precise error rates are hard to calculate, because some test results can be affected by variables such as weather conditions, user error and lighting conditions. Some studies have shown error rates ranging from 1 in 5 false positives to 1 in 3. But even those disturbing figures can get worse if you create an incentive for a police officer to want a positive result. In 2009, the Marijuana Policy Project used the KN Reagent field test on 42 substances that weren’t marijuana. They were able to get false positives on 70 percent of them. The ProPublica report also found that the most commonly used tests didn’t include warnings about the high false-positive rate, despite a 2000 guideline from the Justice Department to do so. Surprisingly, the report found that more than half of those wrongly charged after a false positive actually pleaded guilty, an indication of how the threat of serious jail time can persuade innocent people to falsely confess. Yet even after the 2016 ProPublica-New York Times report was published and received nationwide attention, police departments across the country continued to use the flawed field kids. In Las Vegas, the police department continued to use the kits despite repeated warnings from the crime lab that they were unreliable. In fact, in 2014 the crime lab sent a report to the DOJ warning that the tests were resulting in false convictions, and that better technology was available and should be adopted. The police department responded by expanding the use of the flawed field tests. Police agencies that still use the tests claim that they’re primarily used as a preliminary test, after which the substance in question is sent to a crime lab for more definitive tests. In other words, field-test results aren’t submitted as evidence in trials. But that isn’t always true. A Pro Publica review of 2015 drug cases in Las Vegas found that thousands of people were convicted due to field-test results. But even in jurisdictions where only lab tests – not field tests – are allowed in court, people will still get arrested, jailed for months and possibly tricked into accepting plea bargains because of false positives. The people most likely to be caught up in all of this are of course the poor, who can’t afford bail, are sidled with an overworked public defender who may pressure them into accepting a plea bargain, and who may be more inclined to plead guilty to possession charge in exchange for, say, probation, than to remain in jail (again, because they can’t afford bail) while waiting to fight a more serious charge. 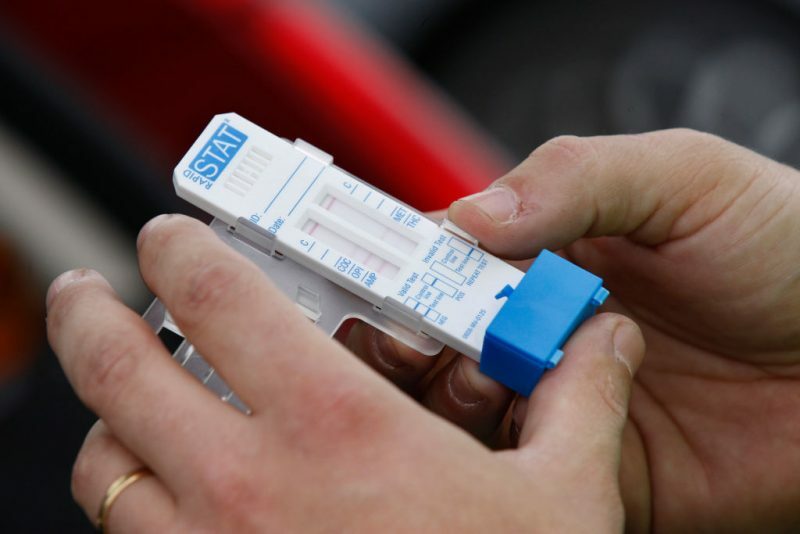 So why do police agencies keep using the tests? One reason is undoubtedly that drug arrests are usually seen as a sign of productivity. Federal anti-drug grants are often tied to raw arrest figures, as are the performance evaluations of individual officers. But asset forfeiture is probably the bigger incentive. If a field test turns up positive on a substance found in your car, the officer who pulled you over can seize your cash, any other property in the vehicle and even the car itself. We’ve seen numerous stories about police agencies who give motorists the option of signing over their cash and going on their way, or insisting on fighting for their property, at which point they’ll be arrested, jailed and perhaps eventually tried who knows how many months into the future. Most sign over their property. It’s easy to see why even an innocent person would do so. In most cases, the hassle wouldn’t worth the cost of whatever cash a motorist may be carrying. In these cases, the positive test result is never scrutinized. Imagine having a tool that magically persuaded people to voluntarily hand over whatever cash they were carrying. Who wouldn’t be tempted to use it early and often? I’m glad to see that the woman in Florida is suing. That’s the only thing that might change all of this. It really ought to be a national scandal. Police agencies are making arrests, jailing people, coercing innocent people to plead guilty and seizing property by relying on tests that, by now, they have reason to know are wholly unreliable. (Note, too, how these tests haven’t been shown to return false negatives. The manufacturers of these kits know what the police agencies want.) The only way it will stop is if there are real consequences for the cities, counties and states whose police agencies continue to use them.